A simple copy and paste from the toastmaster website. * Does the person question existing systems and push for improvements? * Do they offer practical ideas? * When they speak, who listens? * Do others respect them? * Can they create or catch a vision? * Do they show a willingness to take responsibility? * Do they finish the job? * Are they emotionally strong? * Do they possess strong people skills? * Will they lead others with a servant’s heart? * Can they make things happen? This entry was posted in quote on December 21, 2007 by Eva. Last night I went to friend’s family funeral. I was amazed by the condolence flowers his family has received and the number of people attending the funeral. I did not realize that his family was that popular and part of that ‘it’ society. My respect grew tremendously for him last night. Not because I now I realize how well off his family is. But because how grounded he is despite of his family status. It takes a lot of maturity, self confidence, and awareness to be as humble as he is. I am honoured to be his friend. Thank you for the lessons learned. Peace and love for your family always. This entry was posted in friend on December 12, 2007 by Eva. We’re looking for someone who is passionate about their local audience, can pick out and follow a good story, and can meet deadlines in a fast-paced environment. Establish, protect and put forth the Editorial Voice. The MSN Editorial Voice is to inform and also be provocative. It is important everything that we do editorially on the homepage and News channel is aligned with that Voice. We do not cover stories normally; we find a different way to approach a story that is captivating to our users. As we relaunch new media channels for MSN it is important that the editorial team can take this Voice and implement and extend this across many categories. Analysis & continual improvement. Part of our philosophy is to analyse the data we receive to continuously improve our message to our audience. We take advantage of the near-time nature of our medium so we are constantly reviewing how our editorial content performs so we don’t repeat mistakes, we can learn more about our users, and so we can build on the success of our “big-clicking” content.A Homepage and News Country Editor will scan the web for news that is relevant for their users with the objective of attempting to find content that will keep users on our homepage and channels as long as possible. As the Editorial team needs to ensure content is at its ‘freshest’ and most relevant during peak traffic times for the MSN network, extended operating hours are the norm. Some shift work may be expected. A night-shift team will be maintained during the weekday so it is the responsibility of the Homepage and News Country Editor to ensure that team is properly briefed as to what are the key editorial stories to look out for overnight, what editorial content needs to be updated and that the transitions go smoothly. We are looking for three News & Homepage Country Editors. One editor each will be assigned to Singapore and Malaysia individually. The remaining editor will cover both Indonesia and the Philippines. All will be initially based in Singapore but should be very familiar with their respective markets. Must possess excellent computer skills including proficiency in Microsoft Excel and Microsoft Word. Interested? Email me at general.online@mac.com. This entry was posted in job op on December 10, 2007 by Eva. I went to Ubud last weekend for the healing power of ikhlas program, co-managed by True Nature Healing and Kata Hati Institute. I want to tell you more about the program but I am waiting for the handout to be distributed by e-mail. I want to be as exact as I should be. 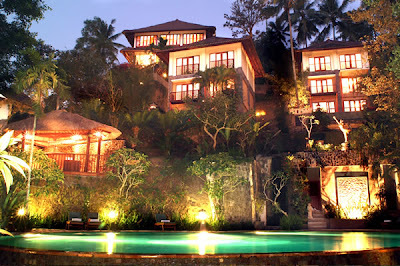 So for the time being, I will share with you the beautiful place that I stayed in: Anahata Villa & Spa Resort. This is the first paragraph the resort uses to describe itself. You can read more about the resort on its website. But I want to tell you something that is not written in the website or the brochure. The name. According to the ever-dependable Wikipedia, the Anahata chakra is physically positioned at the heart region. Anahata is associated with the ability to make decisions outside of the realm of karma. In Anahata, one is making decisions, ‘following your heart’, based upon one’s higher self, and not from the unfulfilled emotions and desires of lower nature. The wish-fulfilling tree, kalpa taru, resides here, symbolising the ability to manifest whatever you wish to happen in the world. Wow what a great choice of name. The people. I had the pleasure to meet Onie Djatmiko, the owner of Anahata resorts. She—and all her staff, and I do mean all—are so into servicing the guests. And if you know me in person, you know this is a huge compliment. Can I have hair dryer? Certainly. How do you make this soup? Oh we do this and that. Would you like the recipe? I left my empty bottle of mineral water on the bar table because I wanted to go the toilet nearby. When I returned, the bottle was already filled in with fresh water. “Your shuttle to the airport would not leave for another hour. Why don’t you have another cup of tea? On the house.” Enough said. The river. Oh the river. 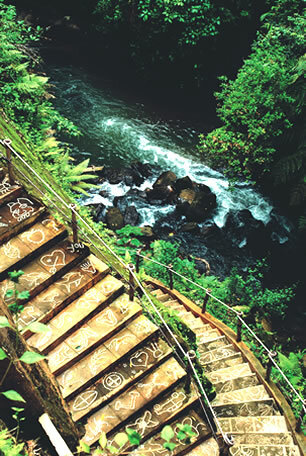 The resort sits by the junction of two clean clear fresh rivers. The Balinese believes such junction to be a pure and powerful place, an abundance of energy. You have to be there, really be there, to believe it. My favorite place, the river bank. Early in the morning (or all day, I don’t care). Alone (or with somebody else, does not matter). Onie, you have one great place. Thank you for sharing. Pics courtesy of the Anahata resorts. This entry was posted in occasion, recommendation on December 3, 2007 by Eva. I am my parents’ child. I am my siblings’ little sister. I am my profession. I am my friends’ friend. I am a follower of my religion. I am a citizen of my nation. Multiple definitions for a single object. Strange. I try defining me through my problems. But suddenly the problems feel unimportant. Insignificant. Not relevant. Not applicable. I am nothing but blessed. And loved. And love. I am you. You are me.Then the I, me, you, we, us, they, them, he, him, she, her, and it get confusing. It does not seem to make sense. Perhaps it is no longer relevant. I am asked to imagine a room, the definition of “me”, and to widen it. I imagine breaking the wall and see a green meadow under a bright blue sky. I feel free until I realize my world is still limited by the ground that I walk on. I still put myself within a boundary. True freedom is still an illusion. I spoke too soon. I am satisfied prematurely. The ego speaks yet again. I picture the world only to see that I am the universe, the nature. I step back to see me more clearly. But no matter how far back I go I still cannot see me. I am nothing. I am grand but I too am a mere spec. The duality concept gets confusing. It does not make sense. It is no longer relevant. There is no need to differentiate. No reason to. There is no plurality. Pick a pronoun and stick with it. One is enough. We do not need more. There is never a need to have more. I want to travel through time. Then it dawn to me there is nowhere to travel through. I cannot see any other destination or dimension. Present is the only time there is. One tense is enough. I sit by the river and have an urge to play with the water. I put my feet in the water and move them around. Then I stop and realize that my feet are still moving without me moving them. The river does it for me. Now it makes sense. I smile without wanting to smile. Let nature take it course. Surrender. Watch wonder unfold. Live from this on, he smiles and says. The soul knows. The rest needs to digest. This entry was posted in personal on December 2, 2007 by Eva.